VIPAccessEXCLUSIVE: Action And Adventure Hit The Wild West In The Magnificent Film “Big Kill” – Here’s A Recap Of The Movie’s Outstanding Los Angeles Premiere! What happens when two, down on luck cowboys and an accountant meet? Well, they head to Big Kill, Arizona, of course! Action, adventure and several attempts (emphasis on the word: attempts) to get out of trouble ensue in the new Western hit of a movie, Big Kill. Written and directed by Scott Martin, Big Kill has an all-star, incredible cast that made this movie a masterpiece and one that will entertain you every second of the way. Right from the start, viewers are drawn in and captivated by the film as we are introduced to two gamblers: Jake and Travis who always seem to know how to be at the wrong place at the wrong time doing something… well, you guessed it… wrong. As they yearn to find a way to start new in life, luck happens to be on their side (for once) when they meet Jim Andrews, an accountant from the east coast who is on his way to Big Kill, Arizona to meet up with his brother who owns a saloon there. The letter that Andrews received from his brother said that the town is bustling and that’s all Jake and Travis needed to hear to decide to embark on this trip with Jim Andrews to the west. However, let’s just say that traveling with Jake and Travis isn’t the most ideal situation since the two men are notorious for getting themselves stuck in sticky situations. Once the trio finally make it to Big Kill, they realize that something is up. The area seems like a ghost town and it is definitely far from bustling. While Jim Andrews has yet to find his brother, they first encounter a corrupt preacher who is ruthless in all ways. The preacher, played by Jason Patric, is backed up by Johnny Kane – someone who is feared by all in Big Kill. Viewers are taken on a journey as Jim, Jake and Travis try to understand what is really going on in Big Kill. The film has an exceptional cast that brought this terrific storyline to life. The remarkable movie stars Lou Diamond Phillips, Jason Patric, Christoph Sanders, Clint Hummel, Stephanie Beran, K.C. Clyde, Elizabeth McLaughlin and Danny Trejo. Not only is he incredibly talented in both writing and directing this film, but he also proves that he’s a brilliant actor too as Scott Martin also starred in the movie and took on the role of Jake. Hollywood met the wild, wild West as the cast and many other celebrities gathered together to celebrate the premiere of Big Kill on October 15, 2018 at the ArcLight Cinemas in Hollywood, California. Lou Diamond Phillips, Scott Martin, Christoph Sanders, Clint Hummel, Stephanie Beran, Elizabeth McLaughlin, K.C. Clyde, Sam Quinn and Jermaine Washington had a stellar time seeing all of their hard work debut on the big screen. It’s clear to see how much passion all of the cast-members put into this project and they definitely did have so much fun making this spectacular and one-of-a-kind film. I, Alexisjoyvipaccess had a sensational time attending the premiere of Big Kill and I truly loved every minute of this film. Big Kill is such a fast-paced movie and every part is filled with unforgettable and jaw-dropping scenes. This movie is so compelling and you’re going to be at the edge of your seat the entire time wondering what is about to happen next. Big Kill deserves two big thumbs up and everyone should go see this movie out in theaters tomorrow, October 19th if you want to see a movie that will leave a lasting impact on you. 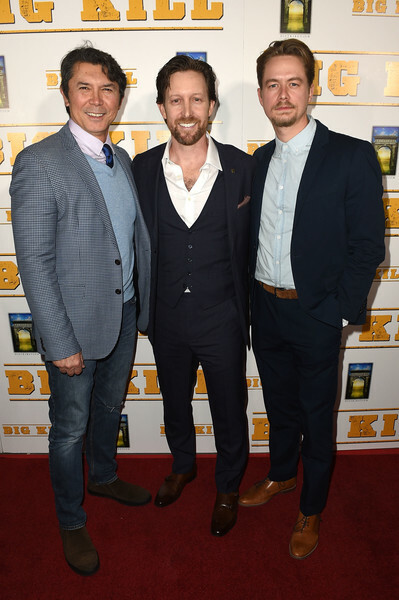 Check out some more pictures below from the premiere of Big Kill and be sure to follow @BigKillMovie on Twitter and Instagram and join in on the conversation by using #BigKillMovie! Previous Article: Larsen Thompson Totally Slayed New York, Paris And Milan Fashion Weeks – Here’s A Recap Of Her Incredibly Fun And Fashionable Time! Next VIPAccessEXCLUSIVE: Jillian Rose Reed, Brooke Lewis And More Showed Their Support Towards Breaking The Chains’ Impactful Event With The IAEDP Foundation – RECAP Here!